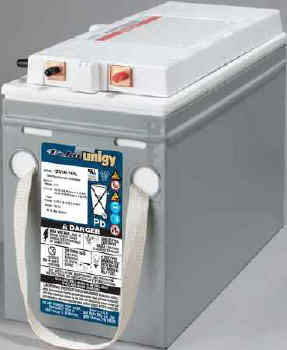 Deka Unigy 12AVR145 sealed lead-acid batteries are available as AVR (absorbed valve regulated) with the following features: Pure lead positive grids, front access terminals, tank formed plates, flame retardant polypropylene, flame arrestor, self sealing vents, epoxy post seals and a design life of 10 years @ 77F @ full float.
? I.C.A.O., I.M.D.G., I.A.T.A. and D.O.T. air transport approved.